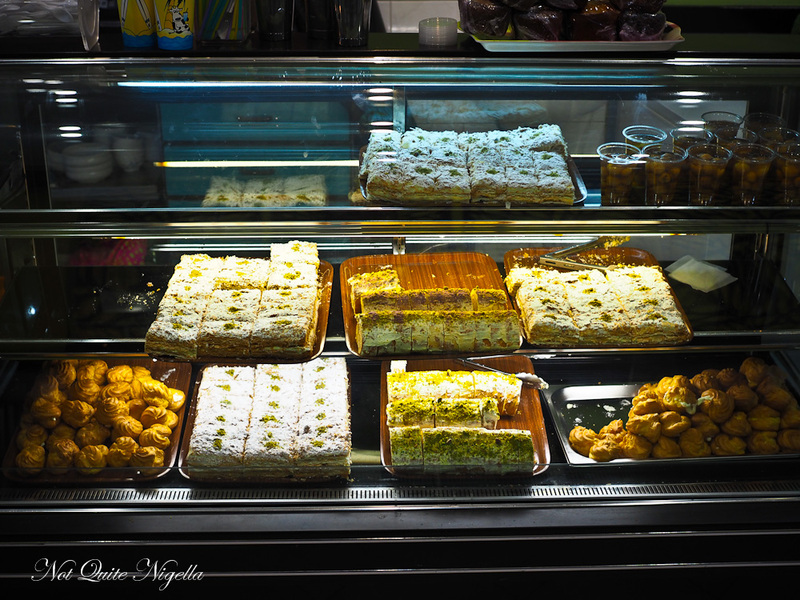 One Friday night we decided to take a drive out to Merrylands thanks to a recommendation from a reader Mrs Flowerpot. She had recommended an Ethiopian restaurant called Aaboll as well as a Persian ice cream shop. What we found was a surprise as well as the chance to eat with our hands! One thing that all my friends have in common is the love of adventure. For us Friday nights can involve driving across the city to a place that we have never visited before and having dinner. And one Friday night it was Mr NQN, Viggo and me in a car on the way to Merrylands thanks to Dear Reader Mrs Flowerpot who had recommended an Ethiopian restaurant called Aaboll Cafe. From the back seat Viggo pipes up, "Did you know that Merrylands is the first place I lived in when I moved to Sydney?" Danish Viggo grew up in Port Macquarie and when he arrived here, his finger landed on Merrylands. Attracted by the reasonable rent, he moved there. It was only when he ran into a group of four men just prior to an armed hold up that he moved out. At first Aaboll cafe looks fairly empty. The front room has a couple of customers but when we walk in and ask for a table for three, we're shown to the back room where there are some large groups of diners. The friendly couple that run Aaboll Cafe are Moses and Jara are from Addis Ababa. Jara is the chef here and the restaurant has been open for just one year. 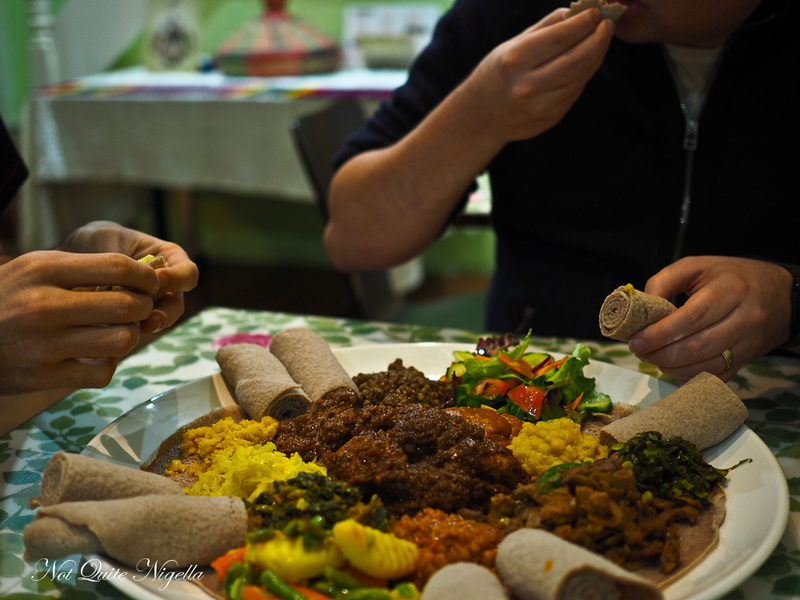 The idea with Ethiopian food is that you eat it with your hands and there is a nearby sink in which to wash your hands. The menu is extensive and split into vegetarian, vegetarian, breakfast and side dishes. It all sounds good so we go with the Aaboll Combination platter and the Vegetarian combo platter served on injera bread. This is a staple with Ethiopian cuisine and is made of teff flour, a soft flour that gives the flatbread a pale purple grey colour. The texture is spongy and light but surprisingly filling (Mrs Flowerpot had warned us how filling it was). 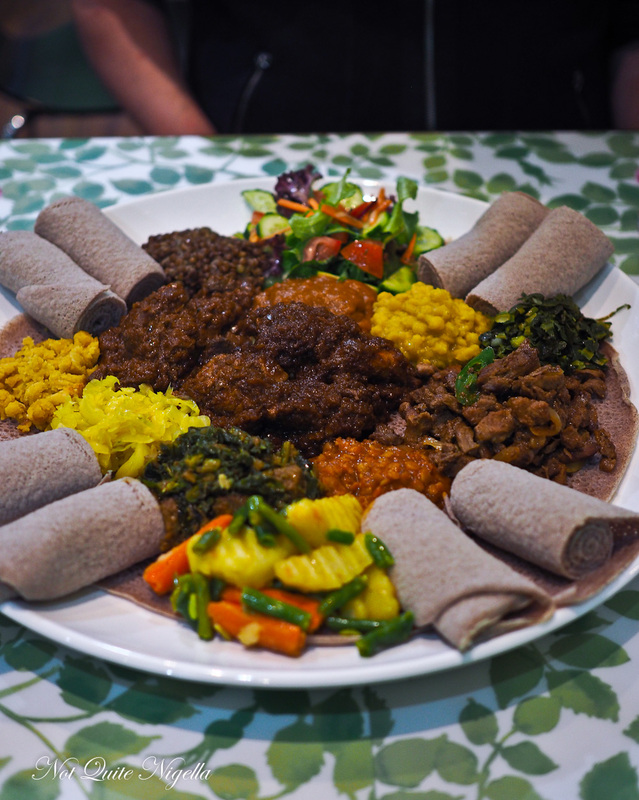 The platter comes out and it is enormous as they have put everything together on a large round of injera bread with rolled out slices on the side. We tear off some bread and use our bread and fingers to pick up a portion of food. Around the outside are the vegetables including butcha (chickpeas with red onion and green capsicum), collard greens, azifah (lentils with olive oil, onion, green capsicum and spices), yekik alicha (yellow split peas cooked with onion, turmeric and herbs), cabbage cooked with potato, onion and garlic and atkelet (carrot and potato with spices). Around the inside are the meat items. There is doro wat (chicken simmered with herb infused butter, paprika and chilli and boiled egg); kye sega wot (beef cubes with a similar treatment to the chicken) and lamb tibs (pan fried lamb strips with onion, tomato and herbs) which is my favourite. Everything and I mean absolutely everything is delicious and I find myself going back for a lot of the butcha and the tender pieces of lamb as well as the yellow split peas. 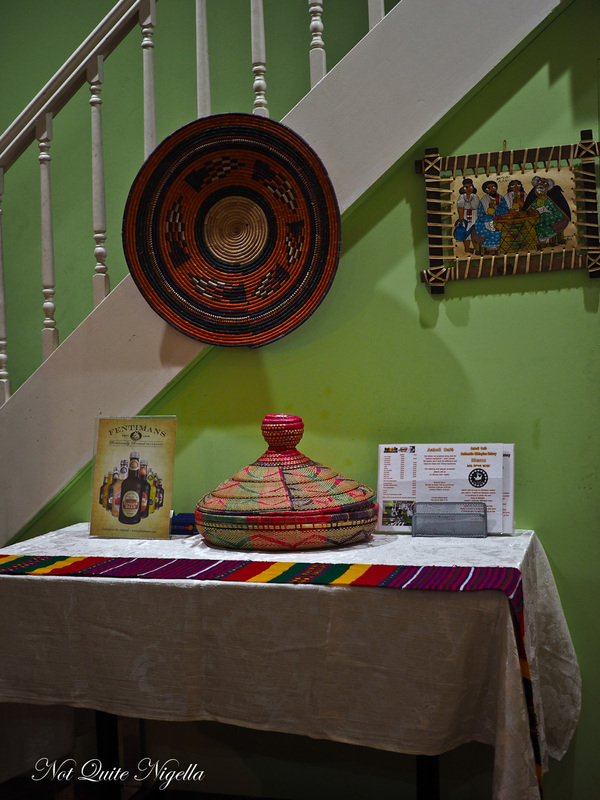 Ethiopian food uses many spices so that it reminds us in looks of Indian food but it is mild and without chilli. And the injera bread is so filling that between the three of us, we can't finish this platter although Moses offers us more bread to pick up the remaining curry. Moses tells us that he is toying with the idea of making waffles and pancakes with teff. For the time being we settle in with a pot of spice tea fragrant with cloves, cinnamon and cardamom that reminds us of mulled wine. There are Western biscuits available and the cafe does a fast trade in the mornings with coffee drinkers. 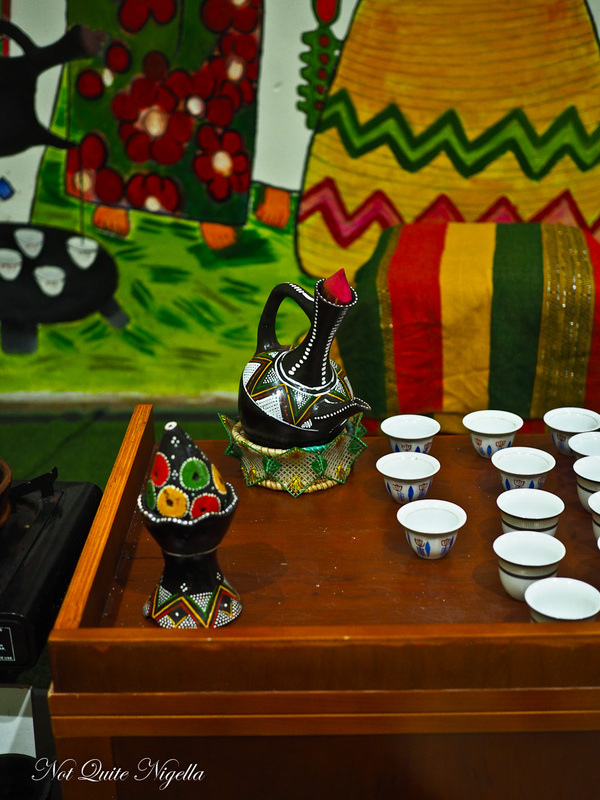 Coffee is an important part of Ethiopian cuisine and there is a coffee ceremony associated with it with freshly roasted and ground coffee made in a jebena (although people can also buy the coffee made in an espresso machine at the front of the cafe). 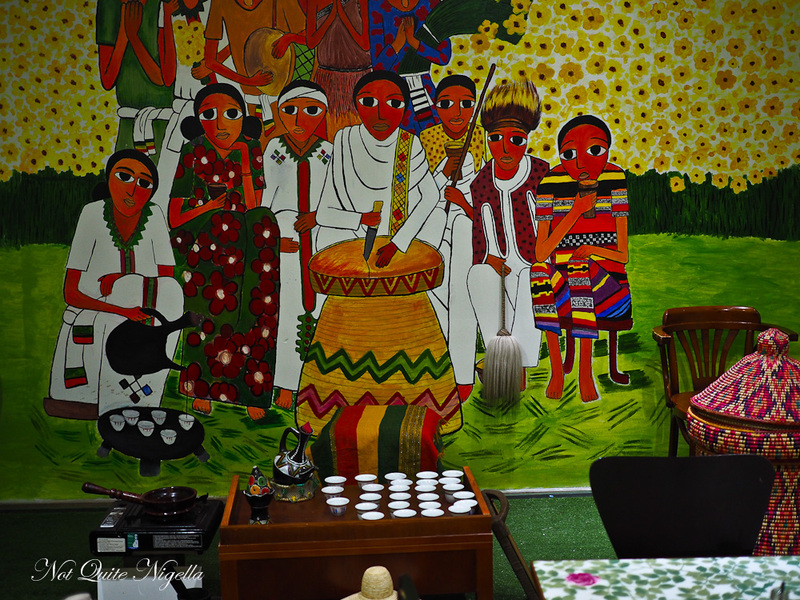 For the coffee ritual there needs to be a minimum of 10 people and it is held in front of the colourful mural. For dessert, we walk down the road for another of Mrs Flowerpot's recommendations. 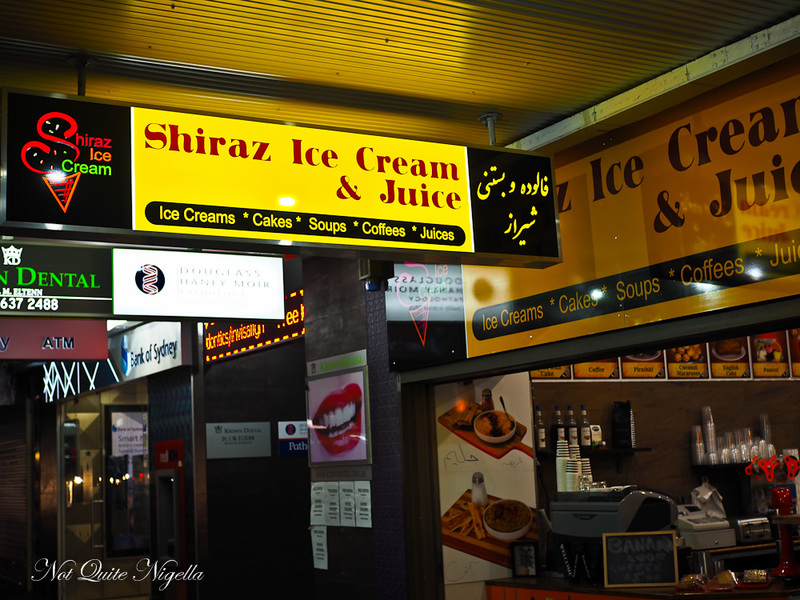 Shiraz Ice Cream and Juice is named after the area of Iran that is known for cakes and sweets. 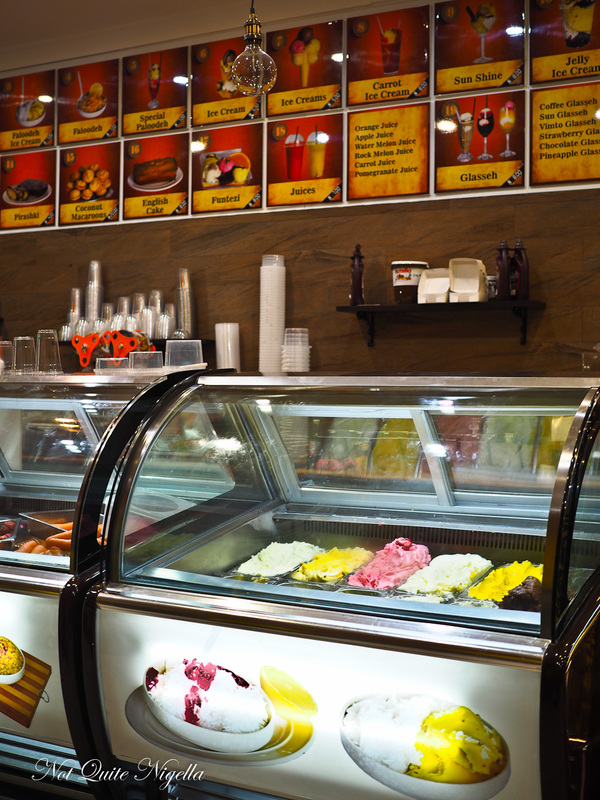 The range of mastic or stretchy gelato is wide and it's delicious but the menu above with items like Majoon, pirashki and carrot ice cream shake beckons. They are incredibly friendly here and offer me a taste of the saffron ice cream - it's divine and with the perfect amount of heady saffron. I am also offered a try of the majoon which is like a thick date shake with nuts and seeds to give it texture. It's also terrific and reminds me of a bircher muesli shake. The other customers are also very friendly, giving us tips and translating items into English. We start with a carrot ice cream shake which is freshly made carrot juice with a generous amount of saffron ice cream. 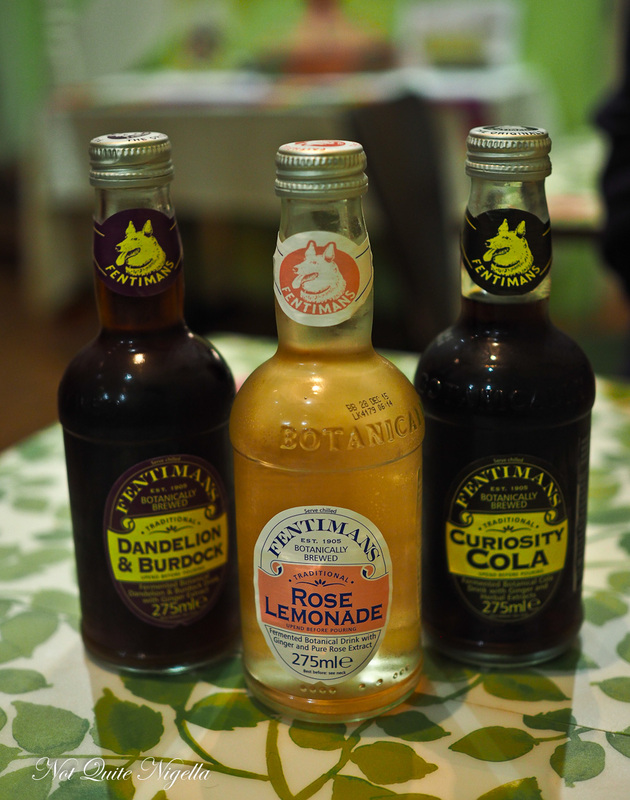 It's unusual at first but after the first few sips we can see how sweet and refreshing this would be on a hot day. 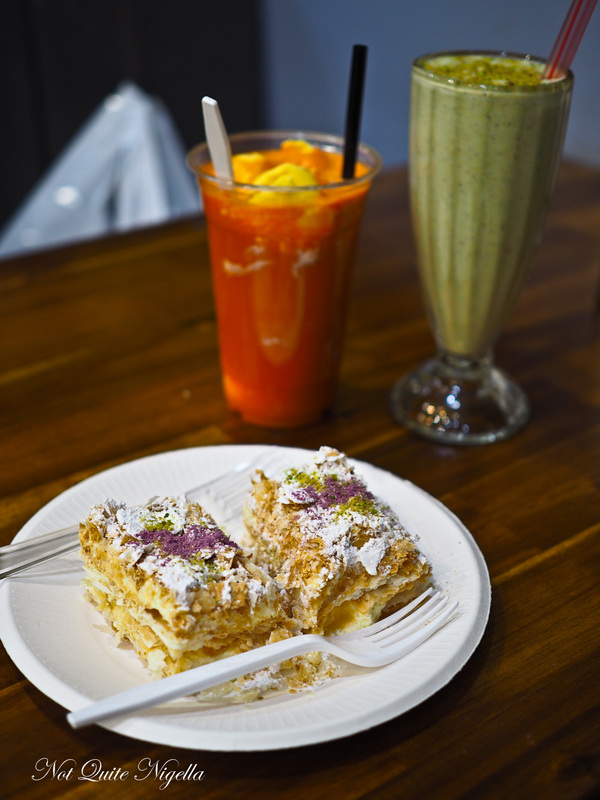 The pistachio milk shake is rich with pistachio and rose and the floral scent is echoed in the cream slice with layers of pastry and cream. 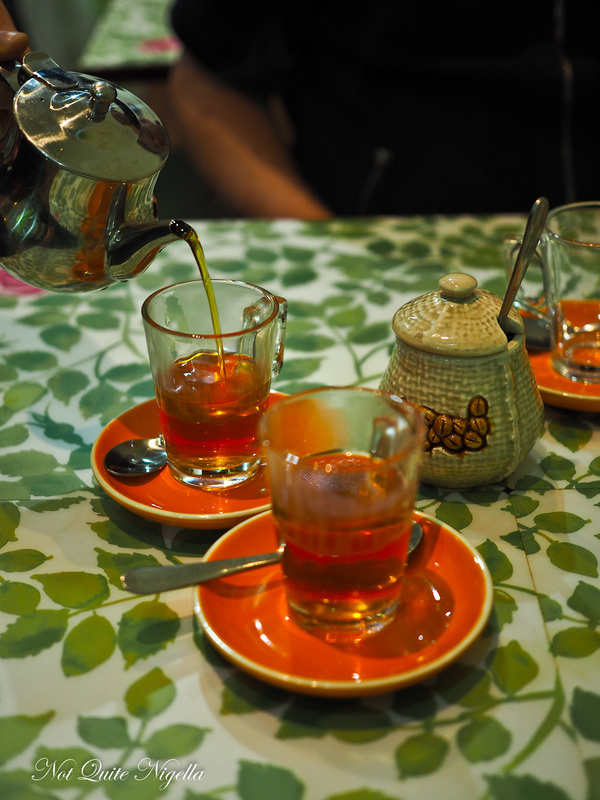 It's all sumptuous and fragrant and we sit comfortably in our booth drinking it all in. "This definitely wasn't here when I moved out," says Viggo. 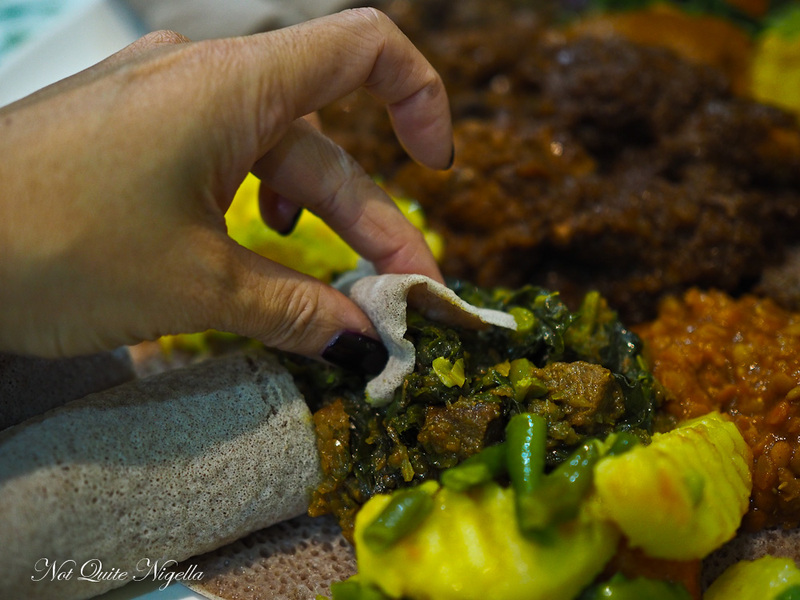 So tell me Dear Reader, have you ever tried Ethiopian food? Do you enjoy eating with your hands? Would you mind eating share platters or do you prefer to have your own plate of food?